(Newser) – Lin-Manuel Miranda reprised his lead role in the hit musical Hamilton on Friday night to start a two-week run in Puerto Rico expected to raise thousands of dollars for artists and cultural groups struggling in the wake of Hurricane Maria. Miranda took the stage for the first time since his last appearance in the Broadway version in July 2016, when he played the role of US founding father Alexander Hamilton, per the AP. It's the first time in nine years that Miranda has performed in Puerto Rico. Opening night drew more than 1,000 people, who bought tickets ranging from $10 to $5,000. The crowd gave Miranda a standing ovation before the show even started, and during the curtain call he wiped away tears and wrapped himself in a large Puerto Rican flag as he briefly addressed the crowd in Spanish and English. During the show's intermission, accountant Zoraida Alvira sat absorbed; it was the first time she'd seen a musical and was transfixed. 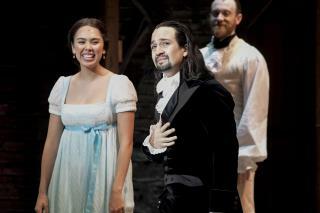 "Here in Puerto Rico, we are not too exposed to theater, let alone musicals," she said as she praised the performance. "I didn't move, and I'm a fidgety person." After the show, Miranda spoke with reporters, who asked him questions about how the White House was exploring diverting money for border wall construction from a range of accounts, including using some of the $13.9 billion allocated to the Army Corps of Engineers after last year's deadly hurricanes and floods. "I think that's absolutely monstrous," Miranda said. Miranda, composer and creator of Hamilton, won a Tony Award and Pulitzer Prize for the musical. There's a bunch of happy Democrat politicians and lobbyists having a good old time in PR. And while they were there, they happened to catch the show. How cool is that?